I know it's not quite spring or summer yet, but I've never been much of a winter person so I've been anxious to greet the warmer months, along with their fruits. So, I went in search of a good tomato salad recipe. 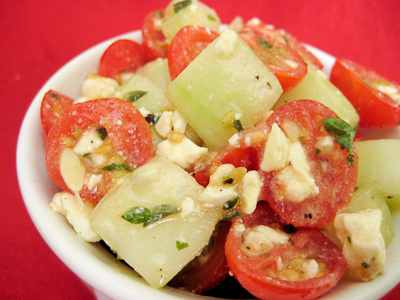 I decided to make a refreshing tomato cucumber feta salad using some fresh frozen herbs I received from Daregal Gourmet. Their herbs are frozen just after harvest to ensure fresh taste. I don't know about you, but whenever I buy fresh herbs from the supermarket, I never seem to be able to use them all before they go bad. I always feel really bad about it, too, because fresh herbs cost a pretty penny. Fresh frozen herbs seem to be a great alternative for cooks like me, because I can have the herbs on hand and use them whenever I'd like, without worry of them spoiling. This salad takes minutes to prepare, and is so light and refreshing. It makes a great starter, but to be honest with you I loved it so much that I ate all of it myself in one sitting like it was an entree salad! The fresh frozen herbs were a great addition. I would say that they're not quite as good as fresh herbs, but much definitely better than dried herbs... so I'm glad to have them on hand in my kitchen. If you try this recipe, make sure you season this salad with lots of coarse salt and freshly ground pepper to bring out all of the flavors. 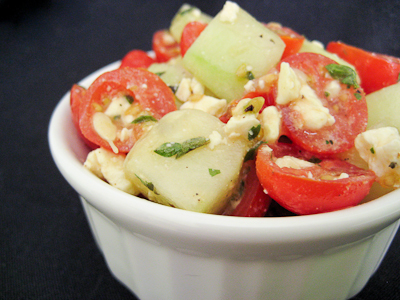 Gently toss the tomatoes, cucumber, feta, onions, mint, and oregano together. Dress with lemon juice, olive oil, salt and pepper to taste. I love the addition of mint in the mix. Gives it that minty blast. Yes herbs are SO expensive.... and then when I don't use them I feel terrible about it! looks like a great product -- and a great salad, a taste of summer in this awful winter! Give me this salad with a piece of grilled fish or chicken and I will be a happy camper for sure!!! Nice and refreshing, just the thing to chase away winter. 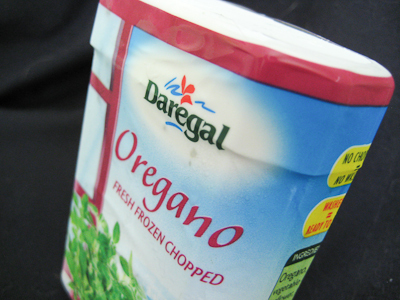 the idea of frozen herbs gives me pause, but if it's actually good stuff then that's quite possibly the best idea ever. lovely, refreshing, summer's-coming salad, jaime! What a great salad. I may wait for the warmer weather but this is a winner. yum, this is the stuff I could live off of. That looks so delicious and refreshing. Now I'm ready for warm weather! Really cute blog! And the salad is a definite winner. Let me be - thanks. that is hard to say on the feta substitute b/c I'm not sure what would be good. feta is a very sharp and salty cheese so you'll need something that has some saltiness to it...or you could just add more salt to the salad. You could try freshly grated parmesan? i have also heard you can try something called Telemea if you have that, it's the romanian version of feta. or maybe you can make this vegan version of "fake feta"
Gosh, that looks do good! :) I've never even thought of frozen herbs...sounds like a great idea! Thanks, Jaime :) Will check it out and let you know. Do you have any recipes on making low-fat cupcakes/muffins?